Kay and Anne have been traveling together since 2002 and documenting their adventures on their blog, BlondeBrunetteTravel.com. Over the summer, they set out on tour to find out what makes Italy’s “boot heel” an amazing destination. 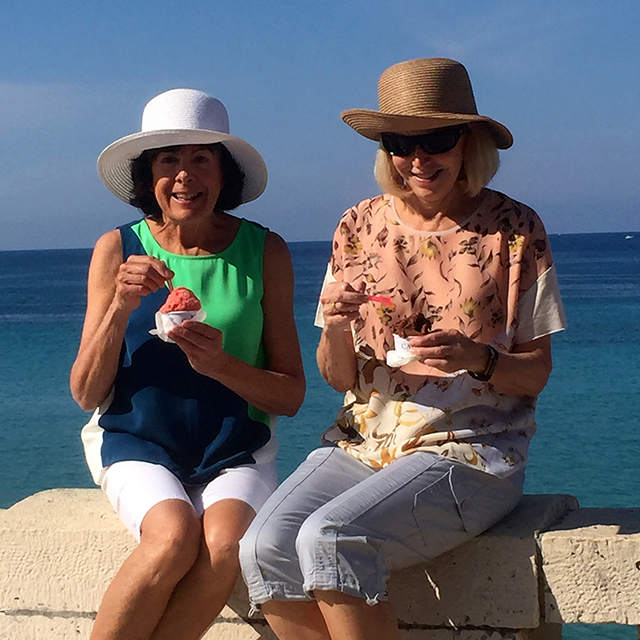 We caught up with Kay to hear about their Puglia & Southern Italy tour. You and your sister have traveled all over the world. What drew you to Southern Italy? We’d been to other parts of Italy before, but this was a region we hadn’t visited and had been reading a lot about it. We were curious to check it out. It’s getting popular, and it’s more up-and-coming. What surprised you most about this region? Discovering that Matera existed thrilled me to no end. This was the top spot for us, in part because we didn’t know anything about it—and we wondered how we didn’t! Matera has a very interesting story, and I like learning the story behind a place. It’s a fascinating city with this amazing past as one of the world’s oldest continually-inhabited settlements. Its history stretches back 2.6 million years, all the way to the Paleolithic Age. Over 9,000 years ago, people lived in interconnected stone cave dwellings called sassi. Ruled by Romans and other invaders, the population endured many ups and downs, and was even forced to leave due to poor conditions in the 1950s. Things started to turn around for Matera when its unique system of rainwater channels was recognized, helping to earn it UNESCO World Heritage recognition in 1993. Matera is being named a European Capital of Culture in 2019, which is going to make a big difference in putting it on the map. It’s so visually unique, too. It’s where the movie “Wonder Woman” was shot! The city was an unexpected gem. We’ve traveled a lot and pay so much attention to top destinations that it’s hard to surprise us, but we were. Were there any other sites that stood out to you? I just loved the coastal parts. The cliffs were beautiful, and they’re not the kind you can see in other parts of Italy like the Riviera. 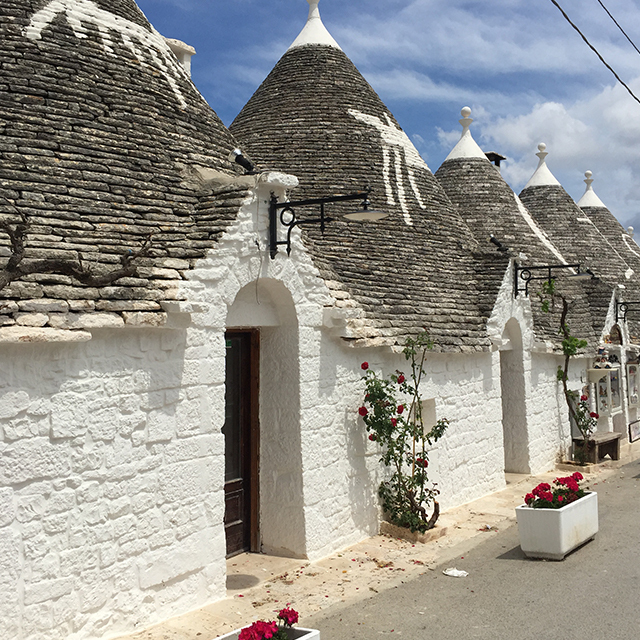 The trulli of Alberobello, a UNESCO World Heritage site, were interesting too. You can see the whole town filled with rows of these houses when looking out in the distance. Some are still inhabited, but many have shops and restaurants in them. Our local guide told us why the trulli have such unique shapes, too. Supposedly, each one has a keystone in the roof that can easily be taken out. In ancient times, it could be removed when the tax collector neared—the roof would fall, and the residents wouldn’t be taxed since the property was incomplete. Who knew? What was the cuisine like in this part of Italy? It was amazing! You’re eating food at the source, and it’s healthy. The pasta we ate was made that day, from wheat grown there, not processed or full of additives. There is a lot of seafood in Southern Italy near the coast, which everyone really enjoyed. The regional wines were also very good, without being too pricey. What was your favorite moment on tour? 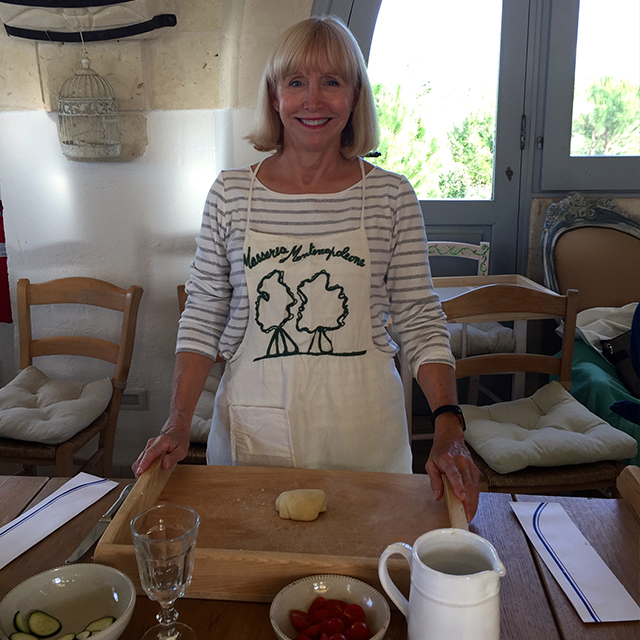 The cooking class and dinner at the masseria, or agriturismo in Puglia, was so much fun. All of the ingredients we used were local and grown right on the property. You hear so much about farm-to-table, and this really was. I loved it. As experienced travelers, what was it like to be on a group tour? With a tour, we could book it without having to spend as much time researching and planning. I just had to pack and go! We had a great, congenial group and never felt rushed or exhausted, even though we joined all of the excursions. We got plenty of time with the whole group and free time to do things our own way, too. Plus, our Tour Director Linda was incredibly knowledgeable and so competent—she took care of everything. A lot of our local guides had a personal connection to the places we visited, and I really value that. Do you have a travel story you’d love to share? Let us know! Send us an email at social@goaheadtours.com.